For many years English GCSE has been unavailable to distance learners. Now, due to changes in the way that Non-Exam Assessment (NEA) is managed, The Oxford Open Learning Trust is proud to be amongst the first distance learning colleges to be able to offer this course to its students. This brand new course has been designed to foster a lifelong love of the English Language and an appreciation of its literature. It will prepare students for the study of English Language at A level for those who wish to and it will enable all students to communicate effectively, in writing and orally, in a wide range of situations. 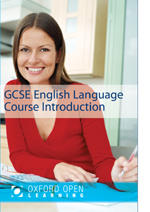 This course of lessons will prepare you for the AQA English Language GCSE 9-1 Specification 8700. To be able to establish a good Skype connection with your tutor which supports video at a quality sufficient for the tutor to read a displayed document. You will need to have valid photo ID, either a passport or a driving license. Oxford Open Learning will record your presentation and copies of the presentation will be made available to the AQA for purposes of external moderation. The oral is awarded as a separate Pass, Merit, or Distinction. The oral does not contribute to your primary 9-1 grade. What is the difference between English GCSE and English IGCSE? The English GCSE and the English IGCSE are equivalent qualifications and are considered to be of an equal level by employers or college/university admissions departments. Both courses are graded using the new 9-1 Grading System. Whilst there are some small differences in content, the main difference between them is in how they are examined. The IGCSE English, like nearly all of Oxford Open Learning’s GCSE and IGCSE courses, is open to private candidates and students can arrange their examination by entering as a private candidate at a local examination centre. The GCSE English has a separately examined Oral component and so is not open to private candidates. As such Oxford Open Learning will entering centre for the student and carry out the oral assessment. The student will need to find a host examination centre where their written paper will be sat. Oxford Open Learning will then arrange for the exam paper to be sent to the host centre. Full details can be found on our Non-Exam assessment page. Why is this course more expensive than the English Language IGCSE? Quite simply, this course is more expensive because it takes more tutor time to deliver the preparation and subsequent assessment of the student’s oral examination.